Does anyone remember a commercial that Ronzoni had over 25 years ago of Italian woman carefully selecting spaghetti strands from trees? That commercial left such an impression on me when I was a child that I actually thought spaghetti grows on trees! Stop laughing at my naivete…. you thought so too, no? Apparently that commercial was a spook that the BBC played in 1952 on April Fools Day about the spaghetti crops in Switzerland. The program feature a family from Ticino in Switzerland carrying out their annual spaghetti harvest. It showed women carefully plucking strands of spaghetti from a tree and laying them in the sun to dry. Although some viewers did not find this program too amusing as it was intended to be, others were so intrigued they wanted to find out where they could purchase their very own spaghetti bush. So, I was not alone in this. I too wanted to know how to buy a spaghetti bush. Well, as it turns out… we really don’t have spaghetti bushes, but we do have Spaghetti Squash. It is an oblong seed-bearing variety of winter squash. The fruit can range either from ivory to yellow or orange in color or green with white streaks. Its center contains many large seeds. Its flesh is bright yellow, and orange or white for the latter variety. 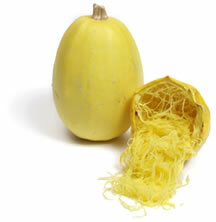 When raw, the flesh is solid and similar to other raw squash; when cooked, the flesh falls away into strands like spaghetti. The taste is quite bland and like spaghetti needs a really good sauce to enhance the flavor. This main dish is like eating a spaghetti con pesto, minus the carbs. The strands are delicately tossed with herbs and then topped with parmesan cheese. Meanwhile, put the butter, herbs, garlic, shallot and lemon juice in a food processor and proces until smooth and creamy. Season with salt and pepper. When the squash is tender, scrape out any seeds, and place a thin slice from the base of each half so that it can sit level. Using a fork, pull out a few of the spaghetti like strands in the center to make room for filling. A a dollop of herb butter, then sprinkle with a little grate cheese. Serve the remaining herbed butter separately adding more as you pull more strands.